I am a bit confused: it appears the Challenge ends on 31 March. I thought it was a by-the-week thing, therefore ending at week 20. I had big plans (BIG!) for the last week’s meal…the last of the Dark Days Challenge of eating sustainably, organically, locally and/or ethically for one meal per week all winter long. Maybe I will post the meal next week anyway: it has a lot of wacky goodness in it. So I thought for this week’s Week 19 I would simply feature a meal sourced from home ingredients grown JUST this year (2010) but…inspiration hit me. Literally! My bag of saved corn husks from our home-grown popcorn dropped on my head from the top shelf when I was adjusting things in the pantry. Luckily, corn husks aren’t heavy. When I was in college, one of my best friends was a first-generation Mexican American whose people hailed from Oaxaca. Homesickness for his mother’s Phoenix kitchen had us trolling for chow in the local Mexican restaurants…but he assured me the comida plated up in our Midwestern college town was but a simulacrum of honest food. Well, I visited him, often, and he was so right! And once, just once, I was fortunate enough to sample the tamales lovingly (painstakingly) made by his Mama and Abuelita. “Labor of love” barely describes the ordeal undertaken by these women, both tiny things, in Mama Maria’s small un-airconditioned kitchen. They would make 250 in a day, some for family, but most for their church…and they did this twice a month! I can’t begin to scale up to that level, but with home-grown and local ingredients I can make an attempt at making at least a few. I did have some cinnamon-laced Mexican chocolate brought back from a friend; why not make mole as well? Okay. That WAS a bit of a labor of love. But: I made the mole last weekend, the pork was leftovers from Wednesday night, and the chicken is terribly easy to cook. With able small hands to help stuff and wrap, this was a fun meal to make and eat. Sounds muy bien! How long did it take to make the tamales and were they steamed? Adios. Sounds spectacular. Tamales are one of my favorites! Wow that sounds delicious! I’ve only ever had tamales once, when a friend made them, and I still remember how very tasty they were, though it was years ago. I am always so inspired by you! 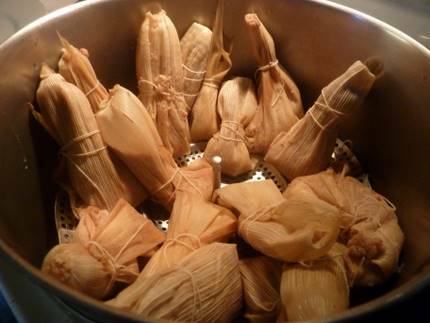 I love tamales but never considered making my own. Was your souffle really a souffle, or a flan? It really is one of those meals best made with many hands, like empanadas. Yummy looking and sounding though. Just reading tamales from Oaxaca made me want to stuff my face. Yum! One should always consult the calendar when setting the end date for a challenge. 😀 I didn’t realize that the 31st wasn’t a Sunday. I won’t be recapping until April 5 at the earliest, so feel free to make your last meal and we’ll feature you! Andy, it did take a while, and indeed they were steamed. You make the tamal mix (corn meal and chicken broth) and let it set awhile, then you whip the lard in the stand mixer…you add a bit of leavener (baking soda) to the tamal then drop it bit by bit into the spinning lard. The point is to make as light/feathery a batter as you can. You have to soak the corn husks in hot water to make them pliable. And once they’re wrapped and set in the steamer, it takes about 40 minutes…so, all told, it was a 2 hour ordeal with a 6 year old. Thanks Mr Jones! I agree: there’s something special about them. Sorry Aimee hope you got your fix. Do you make them? I would imagine it’s in your repertoire with Homero around. Aastricker, aw shucks. They’re fun to make especially if you have a team. And no, if I had had more time I would’ve made a flan, that would’ve been really appropriate. But flans need to chill whereas the souffle cooks when we’re eating dinner, so, it’s insta-hot dessert when we’re finished! Stef, I know, things like ravioli and pierogi or anything small-ish made in multiples does take a while. But we had lots of fun making them! Empanadas, though…now you have me thinking. Laura! Yeah, I should’ve looked at the calendar too and maybe made The Big Meal last week instead of this one. Glad to hear you’re wrapping up after the fact, I guess you’ll just have to post two meals then for me. But hey, it’s all okay! It was a fun challenge, thanks for persuading me! CC, si claro si! Local means the other side of the state, and it’s from sugar beets but…yeah. I gots the flour, the sugar, and everything except olive oil and citrus. Wanna trade? We went to TX over the weekend and had Rodriguez Tamales from Wichata Falls! Yum! They were SOOOO good. We had DH’s mom bring them for our wedding reception too. They, along with the local fresh shucked oysters, were a BIG hit.